At a time when poetry is hip again and neat little reputations can be carved out with relative ease for the driven but essentially mediocre talent, it is curiously refreshing that Cumbria’s own multi-garlanded Terry Jones is not a man to publish before he is good and ready. And good he certainly is: the poetry here is never less than assured, confident and dexterous in execution. Furious Resonance is shot through with the ‘wow’ moments that are essential to good collections and one can see exactly why Terry’s stock is so high with competition judges and editors of serious poetry magazines; for he is a seriously-gifted poet. He does not shy away from tackling some of the big themes: mortality (‘Spuds’, ‘Shadow’, ‘Archaeopteryx’), the sometimes brutal struggle for existence (‘Formicidae’, ‘Christmas Turkey’) and the role and limitations of language itself (‘Sleep-Talking’, ‘Spinning, ‘A Posy for Heidegger’). All of these are handled with an impressive control over voice and form, and even when the poems clunk a little, it is the quality of mind-in-effort that remains attractive throughout. At his best, Jones has a metaphysical wit that allows for occasionally breath-taking leaps of associative power: the burning of old dictionaries in ‘Preservations’ becomes a communal act of primal renewal, taking in the atavistic force of poetry and the imagination itself; as the pages ‘buckled like breath’ and the smoke is ‘hanging undecided on its next mutation / before turning to a dark wing’. The same metaphysical micro-to-macro focus is pulled in the wonderful fourteen-line ‘Formicidae’, when, as flies to wanton boys, battling ants are viewed from the Olympian heights of emotionally limited children, ‘Marvelling like gods’. Elsewhere he is dexterously riffing on single details, exploring their poetic possibilities with a keen eye; as with a lover’s dropped black cardigan in ‘Arrangment’ or the moth squashed between the pages of a re-opened book in a poem of that name. In ‘Kleopatra: Room 62′, Jones marries a resonant central image to a surgical precision of detail that is literally enacted with his description of the mummification process. the first bird on the cross of its skeleton. It ought to be clear that I’m a big fan of this poetry. Jones is – relatively – less successful, however, when he strays from what he does best into closed forms that don’t suit his gifts quite so much. The heavily-rhymed terza rima-like ‘Every Time’ and ‘Lovers by the Ice-Age Tarn’ are both examples of formal decisions which dissipate his energy somehow. Compared to his best stuff these poems feel like the contractual obligations of a serious poet stretching himself and having fun with the language; rather than addressing his essential stuff. However, as Jones himself has it, ‘It’s a matter of where you tread’, and these caveats are small ones against a backdrop of overwhelming success. At forty pages and twenty-four poems, A Furious Resonance does feel a little long for a pamphlet and one can only hope that Terry Jones has even more great poetry waiting in the wings for a first full-length collection that ought to be eagerly anticipated. It could stand a little thinning-out but overall this is a barnstorming pamphlet, full of good-to-great stuff, and well-produced by Poetry Salzburg in A5 with a simple and tasteful graphic design. Buy it and prepare to be impressed. Martin Malone lives in Maulds Meaburn and teaches in Penrith. His Straid Award-winning collection, The Waiting Hillside, was published by Templar Poetry last year. In March, he won the Mirehouse Poetry Competition. the red and black on summer pavement flags. we smeared them on the stones and went away. There’s a change of tack in the next, a great poem, ‘Preservations’. We find the speaker ‘on the day we burned the old dictionaries, / a batch of German-to-English ones.’ Immediately we find ourselves in potentially deep territory, a ‘Bücherverbrennung in the morning.’ Jones forces nothing and allows the poem to speak for itself, with wonderful play, from the pun on sparkle in the German ‘sprachlos’, speechless, to the beautiful description of ‘the last pages’ as ‘a flicker of inklings.’ The hesitancy of ‘Their tongues of flames changed colour, / red becoming violet, yellow white, / as if uncertain of their own identity’ is compared to the ‘sure-fire sense / that verbs burned bluer than nouns, | that adjectives gave off most smoke’. the one dimension of itself. A disembodied Kleopatra views her mummification in ‘Kleopatra: Room 62’; in ‘Archaeopteryx’ we see ‘a silk-screen print on stone: / the first bird on the cross of its skeleton’, the rhyme delicate, the image exact. It is the familiar suddenly perceived, and the sharpness of that perception, found somehow in language, that characterises Furious Resonance. Jones’s eye, pressed against the glass, is a keen one. John North is a past winner of the Anne Pierson Award for Young Writers in Cumbria and is studying for an MA in Creative Writing at Manchester University. This review was first published on The Manchester Review’s critical blog after winning the Centre for New Writing’s 2012 Review Writing Competition. Terry Jones writes poetry and we made a pact then and there on the train. I was to buy his collection of poems ”Furious Resonance” that was just about to be published in the Poetry Salzburg Pamphlet series, whereas he was to buy the ones of my books that have been published in English. So far I don’t know if he has kept his promise, but I sure have kept mine and what a pleasure it was to read ”Furious Resonance”. 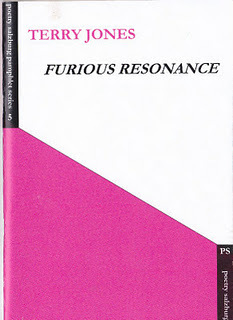 It says on the back of the book that the collection ”explores how the spaces of the past and the present, the personal and the political, the conscious and the unconscious, and the living and the dead re-sound across cultures and languages in sympathy or protest with each other.” Big words, but true as “Furious Resonance” is a remarkable collection of poetry. The twenty-four poems make you think, laugh and listen, because Terry Jones has a way with words. His way of using the English (and German and Xhosa!) language is unique, because this is an intelligent poet with something on his heart and mind and an own voice to express it. Jones’ poetry flows easily. Notice for instance the almost hypnotical cadence of the long poem “Sun” which prevails despite the huge differences in voice and verse in the four parts of the poem. Or what about the imagery of the poem “Sleep-Talking”? An everyday observation made into art. My own favourite is, however, “Preservations”, an unsettling poem about the burning of dictionaries. “Furious Resonance” is one of the best collections of poems I have read within recent years and to think; if I hadn’t been on that train going to Birmingham that day in May, I would probably never have read it! So the next time someone asks my why I don’t have a driver’s license, my answer is going to be: because I like good poetry! Lise Lyng Falkenberg (born May 17, 1962), is a Danish writer of mostly fiction and works of literary studies. Falkenberg was born in Odense, Denmark. Since her first in 1983, a dozen of her books have been published as well as hundreds of articles, essays and reviews on movies, plays, literature, art and music. She has a Ph.D. in literature and cultural studies and is currently living in the city of Odense, Denmark, where she works both as a writer and as an international freelance journalist. · Twisted Tales of Thanatos, ISBN 87-90767-72-1, 2003, a collection of short stories written in the magic realistic genre. Since 2005, Falkenberg has worked with British rock band Slade, especially their drummer Don Powell and this has led to a string of Slade-related blogs on the internet as well as many articles and interviews in magazines and papers. In 2006 Don Powell asked Falkenberg to write his biography and the book is due to hit stores in late 2010.